Whether you are a seasoned diver or newly certified, taking your own boating and dive trip can be quite a change from the planned, guided excursions you have had in the past. Just like the quality of guided trips are often determined by good pre-planning, a well-planned personal dive trip can be equally rewarding, and will allow you to dive and boat on your own terms as well. Here is a planning guide to help you create the safe, fun, and exciting dive trip you are hoping for. Whether this is a new, exotic location or the shipwreck just down the road, a well-planned trip will help ensure that you have a safe, rewarding dive. Much of this can be done in advance to help you decide the best time to go, and to verify that you have all of the necessary items for a smooth journey. Here are the key factors to consider long before you warm up the boat to leave. Time of Year: Depending on the location and month, a poorly planned trip can put you in weather conditions like hurricane season, or unseasonable temperatures that are either too cold for a comfortable dive or too murky with plankton to have any visibility. Wildlife can play a factor in this as well. If you are diving to see a particular creature or event, plan your trip during the time of year that it is found — humpback whale songs may be plentiful in Hawaii’s winter, but if you arrive in June, they have already headed to Alaska. Of course, there are also some times of year you will want to avoid, like jellyfish blooms. Time of Day: Again, when you are looking at wildlife, certain creatures are more likely to be found active at certain times of day. If you are not sure what you want to see, there is also the factor of prevailing weather patterns and tidal currents that will change during different hours. Be certain to consult a current chart (a companion to a tide chart) when looking at your dive location. You do not want to be there during a large tidal exchange and a strong current, unless you have specifically planned a drift dive. Choosing your time of day might mean looking at the time that most dive companies head to a popular site, and trying to dive in-between, before, or after they bring groups through an area. Another fun thing to consider with time of day is the possibility of night dives — they can give an entirely new perspective to an otherwise familiar dive site, with both bioluminescence and some large, nocturnal creatures that are asleep during the day. Experience Level: If you are new to an area, or new to diving, this is particularly important. Learn the dangers that are inherent in an area, whether they are currents and rip tides, jellyfish, sea lions, sharks, or an unstable shipwreck. If you do not have someone experienced in your group, consider going out first with a guide to become familiar before embarking on your own. It is always a good idea to dive only as pairs or groups, and with certified divers only. Logistics: Once you have chosen your location, take a look at what requirements there are to dive in your chosen area. Places like the Galapagos require a special license that is nearly impossible for anyone but certified guides to get. Other places may be open to anyone, but you may need a certain level of certification before they will be willing to let you rent the gear you need. Making the right phone calls ahead of time will allow you to avoid disappointment. Another important thing to do when you have chosen your location is to determine the location and phone number of the nearest decompression chamber and hospital with experience in dealing with dive-related injuries. Choosing the right boat to dive from is another important component to pre-planning. Although most boats can be tweaked to be serviceable for diving, there are definitely certain features on a boat that will make your trip much simpler and more enjoyable. 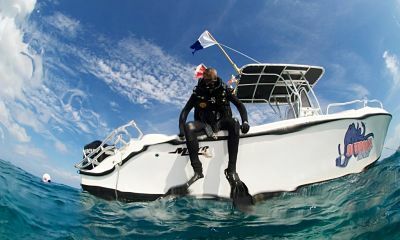 Storage: The best dive boats have an open deck where you can store gear and dress for the dive. Ideally, there is room for your entire party to gear up at the same time, and to wash the salt off with a hose at the end of the day. Entrance and Exit: Though most people are okay with a high entrance point, it is not as easy to re-board a boat with high sides and a poor back access. Just because a boat has a swim step and ladder does not make it ideal for boating. Dive ladders tend to be longer than swim ladders, and the rungs are shaped like the letter I instead of the letter H. This allows for people to either climb up with clumsy fins or to stably hold on in high-current areas while they remove some of their gear before climbing. Though some divers are strong enough to heft themselves in full gear onto a swim step, it is important to consider the abilities of each diver in the party, as well as the logistics of getting an injured or unconscious diver out of the water. Shelter: A long dive day can cause hypothermia risks in many divers, and because of this, a shelter is a good idea. If your boat is open, it may just mean a corner away from the wind with blankets. Shelter is also a good way to avoid an unexpected sunburn after a day on the highly reflective sea. Safety Features: Your boat needs to be fully equipped with all of the necessary safety equipment needed for the level of water you will be travelling in. Life jackets, lifeboat, flares, a first-aid kit, and a working VHF radio are all things you may need to check for depending on the water where you are traveling. Be certain to add sunscreen and vinegar for jellyfish stings to your kit. Divers who are trained in rescue and medical diving may consider bringing a diver oxygen bottle for emergencies as well. A working anchor and line are important as well. It is always a good idea to have a packing list before you embark on a trip like this. If you are very organized, you may already have your dive gear stored in a way that it is grab-and-go, but there are other components to consider as well. Here are the main categories your list should cover. Gear: All divers should have everything they need to embark on their trip. For safety’s sake, gear should be maintained and inspected annually to avoid problems. This includes air tanks. Always bring spares of the necessary extras that can get lost or fall off of a boat — an extra mask, wax sticks, powder, antifog, sunscreen, etc. A dive equipment repair kit with o-rings is another good idea that can keep a dive trip from becoming just a boat ride. For those who have rented gear, be certain that the items you need are reserved, and that you have a day ahead of time to go in and ensure that they will fit comfortably and well. Meals: Whether you are planning a day trip or a multi-day liveaboard dive excursion, it is always a good idea to have meals. This includes more than enough water to keep everyone hydrated, and the ability to heat some water to aid a hypothermic diver. For boats without a galley, sandwiches or other healthy grab-and-go food is a good idea, even if you are only gone a few hours. If you are headed out for a long day or overnight trip, pre-prepared one dish meals are an easy way to make sure you are eating enough healthy calories without wasting all of your time in the galley instead of in the water. Boat: Again, it is a good idea to make certain your boat has all of the requisite safety equipment. In addition, check that you have what you need if you get stranded at sea. For some, this is a working VHF radio, a working cell phone, and the phone number of the local sea tow agency. For others, this may mean oil or other fluids, fuel, hose clamps, and tools to tweak the engine. For everyone, it should include a chart of the locations where you are planning to dive, and a dive plan to leave with someone on land so they know where to notify others to look if you do not return on time. Though it may feel like a lot of work now, taking the time to plan a boat dive the right way will actually make your life easier. On the day of the dive, this will allow you to spend your time underwater, where you want to be, and not on the boat solving problems. A successful first trip will also make it more likely that you will be able to have many more adventures in the future.